On the shores of the Dead Sea is the mysterious community of Qumran. 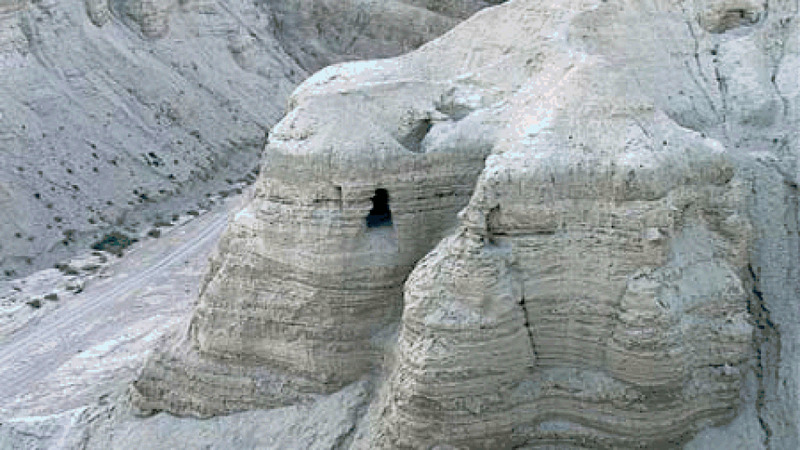 There is much debate as to what the ruins at Qumran signify. Most believe it to be the home of the Essenes. There is still much speculation on exactly how they lived. However, we do know that the treasure of the Dead Sea Scrolls which were hidden in clay jars until a shepherd boy found them in 1947, where hidden in caves at Qumran. No modern archaeological find is more associated with the word of God than the Dead Sea Scrolls. The word of God be easy to pass over in an era of the internet where anyone can write about anything, but the Bible is what God has chosen to reveal to mankind about Himself, His creation, His providence, His judgment, and His redemption through Jesus Christ. There is nothing that can remotely compare. The word of God is also not static as can be seen below. The word of God is quick and powerful and sharper than any two-edged sword. It reveals sin and preached it is the power of God to salvation to those whom believe. 20: Knowing this first, that no prophecy of the scripture is of any private interpretation. 21: For the prophecy came not in old time by the will of man: but holy men of God spake as they were moved by the Holy Ghost. 11: Searching what, or what manner of time the Spirit of Christ which was in them did signify, when it testified beforehand the sufferings of Christ, and the glory that should follow. 12: Unto whom it was revealed, that not unto themselves, but unto us they did minister the things, which are now reported unto you by them that have preached the gospel unto you with the Holy Ghost sent down from heaven; which things the angels desire to look into. 23: Being born again, not of corruptible seed, but of incorruptible, by the word of God, which liveth and abideth for ever. 25: But the word of the Lord endureth for ever. And this is the word which by the gospel is preached unto you. 13: For this cause also thank we God without ceasing, because, when ye received the word of God which ye heard of us, ye received it not as the word of men, but as it is in truth, the word of God, which effectually worketh also in you that believe. 16: For I am not ashamed of the gospel of Christ: for it is the power of God unto salvation to every one that believeth; to the Jew first, and also to the Greek. 12: For the word of God is quick, and powerful, and sharper than any twoedged sword, piercing even to the dividing asunder of soul and spirit, and of the joints and marrow, and is a discerner of the thoughts and intents of the heart. 11: So shall my word be that goeth forth out of my mouth: it shall not return unto me void, but it shall accomplish that which I please, and it shall prosper in the thing whereto I sent it. 1: Thus saith the LORD, The heaven is my throne, and the earth is my footstool: where is the house that ye build unto me? and where is the place of my rest? 2: For all those things hath mine hand made, and those things have been, saith the LORD: but to this man will I look, even to him that is poor and of a contrite spirit, and trembleth at my word.